On 16th August 2013 Shelter Associates commence trials of the Shelter Associates survey mobile application. Shelter Associates community workers took a tablet computer into the slums and tested the system of uploading slum data direct to the Shelter Associates on-line data collection system. Shelter Associates have created city profiles for Pune and Sangli & Miraj which are hosted on the Shelter Associates website and are maintaned and updated by Shelter Associates on a regular basis. Each city profile contains information for all slums within the municipal area including: the land ownership, development plan reservations, development plan zoning proposals, approximate area, population, location, topography, in addition to detailed data regarding services such as toilets, water, solid waste management, drainage and roads and access. The information is freely available for everyone including city administrations. 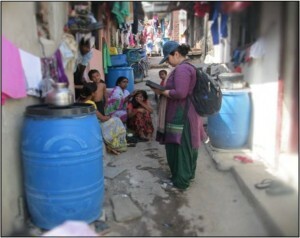 To support the on-line city profiles, the NGO has developed an on-line survey system where all collected data can be input, and recently Shelter Associates has developed a mobile application which allows data to be uploaded to the on-line survey system by a surveyor with a smart phone in a slum, ward office, or any other location. In early March this year a Google Earth satellite passed over Sangli & Miraj, the urban area in Maharashtra where Shelter Associates are implementing the Integrated Housing and Slum Development Program (IHSDP) under the Government of India’s Jawaharlal Nehru National Urban Renewal Mission (JNNURM). The resulting satellite photographs, which can be viewed on the Google’s application Google Earth, provides a unique aerial perspective of the construction sites where the site layout can clearly be seen. The software also records the history of the IHSDP in this area as the historical imagery function on Google Earth allows earlier satellite photographs to be viewed, photographs taken prior to the construction of the new houses when the area was a slum. Viewing the satellite photographs before and during construction of the new site layout poignantly illustrate the benefits of the new layout: (1) the access for the emergency services will be easier, (2) the capacity of the site has increased (in the case of Sanjay Nagar – from 311 slum huts to 434 apartments) allowing slum communities from nearby slums which either cannot be developed or flood to relocate here in walk up tenements which are G+3, (3) all of the buildings are organised around a central semi-public open space, (4) all of the apartments are organised around a semi-private courtyard, a strategy which allows natural light and natural ventilation to be maximised and minimises the requirement for (expense of) artificial lighting and ventilation, (5) the new buildings are capped with accessible terraces which can be used for a variety of community purposes such as a quiet place for children of the community to study. Shelter Associates has been chosen from among 160 NGO’s across India as the winner of the Dasra Giving Circle grant for supporting a city-wide urban sanitation program in Pune over the next 3 years. Dasra, India’s leading strategic philanthropy foundation, undertook a process to determine which NGO’s in India are doing work which: (1) has a direct impact on urban sanitation, (2) has the ability to reach high volunmes, (3) has links with the government, and (4) has a sanitation model which is scaleable. Dasra researched over 160 NGO’s and identified 15 organisations for visiting. Dasra came to Shelter Associates Pune office to meet with the Executive Director and the Shelter Associates team to learn about the history, philosophy, working methodology of the NGO. Site visits were also conducted so that the Dasra representatives could interact with Shelter Associates project beneficiaries to witness impact on the ground. Of the 15 organisations visited 9 were determined by Dasra as being organisations which could deliver high quality at scale. The 9 organisation were then whitled down through an internal process within the Dasra team to identify 3 organisation who would be invited to present to the Dasra Giving Circle (DGC), a group of 15 philanthropic individuals who all pledge an equal amount into a collective pool which is awarded to 1 of the 3 presenting organisations. Shelter Associates gave a presentation to the DGC which focussed on the evolution of the organisations model for providing individual sanitation in the urban and peri-urban slums and described how the individual sanitation model would be scaled up to cover Pune in a city-wide slum sanitation project. The 15 DGC members cast their votes which resulted in a Shelter Associates victory. On 22nd March 2012 Le Monde, a leading French newspaper, published an article and an infographe (photo story) of the Integrated Housing and Slum Development Program (IHSDP) in Sangli and Miraj. Pratima Joshi, Executive Director of Shelter Associates, recently participated in a social media technologies workshop through the Ashoka Foundation. Identified as having used web 2.0 and/or social media technologies to advance SA’s work, she was invited to the Rockefeller Foundation’s Bellagio Study Center in Northern Italy. The purpose of the workshop was to determine how an NGO can best use social media tools to transform their work and generate ideas and solutions to specific problems. Innovative social change work can be accelerate with the use of innovative communications technologies. 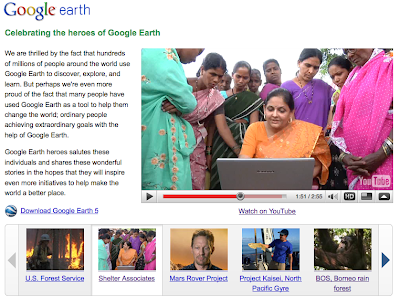 Google Earth has featured Shelter Associate’s work under the Heroes of Google Earth campaign. Shelter Associates was chosen for it’s innovative use of Google Earth as a urban planning and development tool to help the urban poor gain access to housing and essential services (water and sanitation). Shelter Associates is the only organisation in India to be named as a ‘Google Earth Hero’ and shares the accolade with only 8 other organiations internationally.